Paul Renouard original etching "A Drury Lane: Avant de paraitre"
Medium: original etching. Published in Paris in 1906 for the Revue de l'art ancien et moderne. This is a magnificently rich, dark impression on laid paper. Sheet size: 11 1/2 x 8 inches (295 x 200 mm) with no margins. Signed in the plate (not by hand). 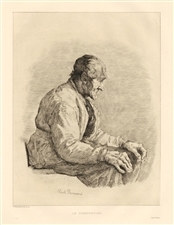 Paul Renouard original etching "Le Charpentier"
Medium: original etching. This impression on laid paper was printed by A. Salmon and published in Paris by L'Art ca. 1880. Size: 11 x 8 3/8 inches (image) -- 280 x 212 mm. Signed in the plate, not by hand.